Donna shares her passion for health and wellness with many. 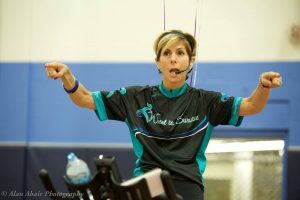 Donna has shared her knowledge and expertise teaching credited courses in athletics and coaching at both Quinnipiac University and Ohio University; Pilates and Spinning to the members of a local JCC, as well as boutique studios in Palm Beach Gardens. She is a Master Spinning Instructor and International Presenter for Spinning, representing Mad Dogg Athletics. Leading a ride in the Wheel to Survive South FL is an honor for her. In 2014/15 she was invited to lead a ride at the Wheel To Survive Dallas and has been connected ever since. Please join Donna in her efforts to remember those women who have lost their battle to ovarian cancer and to help educate and prevent other women (and men) from having to fight ovarian and breast cancer. Don’t just be a hero and donate…be a hero by donating and riding on April 30th, 2017. Register now to ride with Donna and others as we fight to end ovarian cancer!